My two cents on being a frugal, vegetarian, mother, yoga instructor, knitter and eco friendly human. 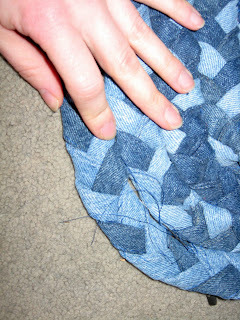 Ruthie had asked for instructions on my braided denim rug. I don't pretend that my way is the best way, especially since this project has been largely dormant for well over a year. That having been said, I do like the way it looks. I start by cutting the strips into strips that are about 2 1/4 inches wide. I don't care how long the strips are because they will be sewn together into a long strip anyway. I try to keep the strips I've cut organized by color (amount of fading actually). This allows me to keep the colors in my rug marbeled rather than winding up with a big patch of one color or another. To get started, I sew several of the same color strips together until I have a strip that is about 6 feet long. I find anything longer is difficult to work with. You might even want to start with a shorter length until you get used to the braiding process. Repeat this until you have three strips that are about 6 feet long or your chosen length. Here's the time consuming part. I fold the edges of the strips in and sew them together to create a finished edge. So the strip you actually braid with winds up being about a 1/2 inch wide. In looking at other rag rug patterns on the internet (and let's face it, this is a rag rug), I don't know if this is really necessary. I'd love to hear from other people who've done it without sewing the edges. Once I've sewn the edges I roll up most of the strip to make it easier to work with. I sewed the ends of the three strips together and began braiding. This is a pain to get started. I pinned mine to the arm of the couch to keep it steady while I tried to get the braid started. 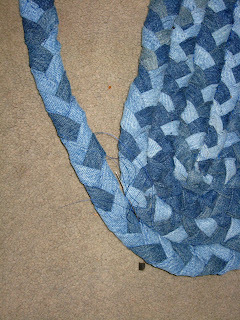 I try to be very deliberate about the braiding and avoid twisting the fabric so the finished product will lay flat. Is this really important? I suspect because of the weight of the denim that it might be. However, if you were using a lighter fabric or you weren't finishing the edges, it probably wouldn't be a big deal at all. Once I had braided a length of about 3 feet, I folded the braid in half and stitched the center together to create the center of my rug. From that point forward, I sew a few more strips on, finish the edges, braid a little, and sew the new lenth of braid onto the rug. To give the rug more stability, I periodically flip it over and sew the back edges of the strips together as well. Ruthie found this rag rug tutorial, which I'm really intrigued by. 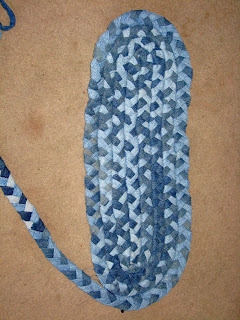 Here are instructions for another braided rag rug. Here's a book that sounds very interesting on the subject. I've just requested it through inter library loan so I'll let you know how it is. by Jean Ray Laury and Joyce Aiken. Countryside Press: Philadelphia, 1972. That is the coolest idea! Shoot, how many old jeans have I thrown away in the past. You know the ones that arn't even good for the thrift store donations. Thank you for sharing your idea. I love it! I am making one of these! How do you keep the stitches you sew the braid together with from showing? I confess, I'm not doing anything special to make the stitches invisible. The stitches just seem to blend in. I guess the secret lies in getting a color of thread as close to the denim color as possible. How are you sewing the strip to become 1/2 inch finished edge are you turning it inside out so the seam is not showing? How do you sew the strips together? I read one pattern that said to sew them at right angles, but I have no idea how to braid that. My mother who is 91 years old gave me a set of three metal cone looking things about 1 3/4 inches long that you thread the strips through and this "thingy" turns your raw edges under for you; no sewing. And yes, it looks, and wears so much better with the edges under. She gave me two of the ones she made years ago and I am still using them. They look brand new except softer. Hi! I just found your tutorial on this jean rag rug thru squidoo.com. It looks great. Thanks for sharing your idea and step by step instructions. I've made braided rugs for years and I only sew the strips together for the length. I fold the strips like bias tape is folded and then braid. There are no raw edges, but there is the 'working' edge and 'finished' edge. Also, sew the long strips together on the bias, and not at the same place as the other strips, so that there isn't a big lump when you come to the seam. This is such a great idea and I love the way the rug looks! The only suggestion I would make is to use the strongest, heaviest thread you can to sew the strips together. 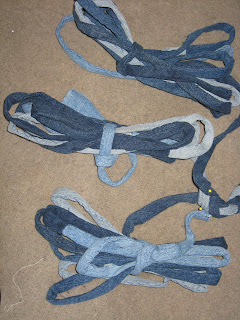 Having woven many rugs with denim, I can testify that the thread will wear out YEARS before that tough old denim does! In rugs, denim is almost indestructible! I love this. Going to start on one soon. Yours looks great. How do you connect the braided strips to the centre that you first create? 1) I left the frayed edges on the strips and did not cut them as parallel pieces. 2) I did not sew the edges of the strips together. 3) I braided the whole rug before sewing it together. So here I am ready to start sewing it all together, and I was hoping you might have a tip (or tips) about starting the rug. I'm considering sewing the beginning ends together, and I've purchased quilting needles and thread. I'm all ready, except I don't want to have to redo it, like I did (3X) while braiding it all together. What an interesting idea to add a little carpeting to a room. My sons have all grown out of their pants, and I think I'm going to have to try this. Something like this would go perfectly in their room after we install the new carpet next month. I'm so excited to start on this new project! I have done rag rugs many years ago and started out sewing the pieces together. Then I learned another way of joining them together by making a vertical slit in each piece of material at the end about half an inch long or long enough to slip the material thru. Then push one end thru the hole and bring the other end thru it, tighten it and smooth it out. Keep adding strips as you need them. This is hard to explain but maybe it will make sense by actually doing it. Thanks so much I am looking for things to do with denim. I think I will try this. I'm very interested in these come thingies! Can you send a picture or give me any more information about these? I think you are talking about a bias tape maker. How do you sew the ends of the strips together so that no raw edge show and it's not too bulky?? Or do you sew them end to end BEFORE you turn them in lengthwise to make your strips? 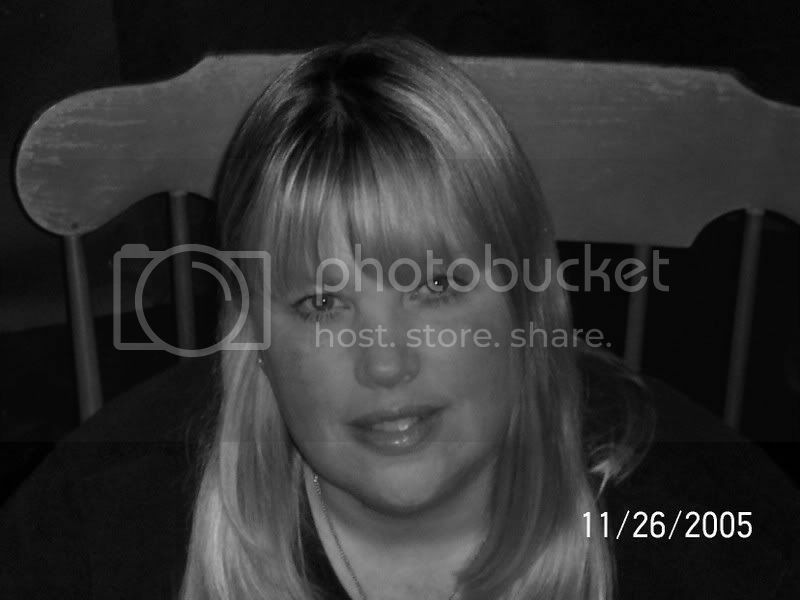 I'm Katie. 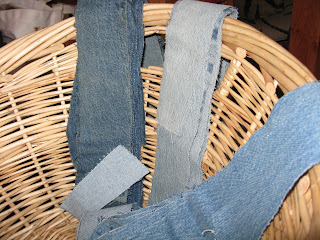 I love to knit and sew using upcycled and rescued fibers and fabrics, especially jeans and t-shirts.